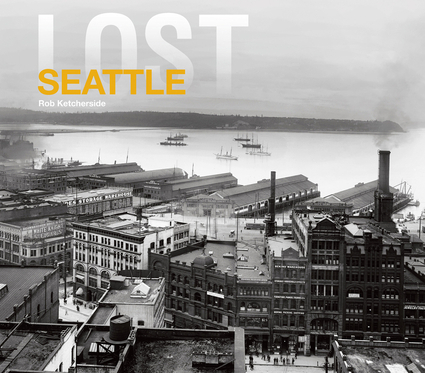 Contains 68 different losses from the 1870s up to the present day, including schools, churches, theaters, creeks, ferries, racetracks, parks, stores, hotels, offices, and factories Organized chronologically starting with the earliest losses and ending with the latest, this book features much-loved Seattle institutions that failed to stand the test of time, along with old-fashioned hotels and sports facilities that needed to be updated or built over. Buildings erected for the World’s Fair Exposition, along with movie theaters that the age of television made redundant. Losses include cable cars, Denny Hill, the Washington Hotel, the Fox Theater, Golden Potlatch, the losses of the Great Seattle Fire, Hotel Seattle, Jackson Ridge, Japantown, Joseph Mayer clock factory, Kalakala (Ferry), Kingdome, Carnegie Central Library, Longacres Racetrack, Luna Park, Moran Brothers’ Shipyards, Yesler Mansion, mud flats, the Waterfront Streetcar, and the Wawona (Schooner). Rob Ketcherside writes about local history through a series of blended rephotography (then and now) for the Capitol Hill Seattle blog. He has led tours of Seattle's historic clocks for the Seattle Architecture Foundation and neighborhood history for Seattle’s Museum of History & Industry. His various contributions at MOHAI—including research of artifacts and photographs—recently earned him Volunteer of the Year. Rob is an appointed member of the Mayor’s Seattle Landmarks Preservation Board, stopping more treasures from being lost. He lives in Seattle.